Love life as it is, not as you want it! Lord, wilt thou fill my soul with peace, That pain and sorrow there might cease? Let songs of praise and of glory fill my ear, And may thy holy spirit linger near. Lord wilt thou fill my heart with love, Oh, That I may see thy realm above? 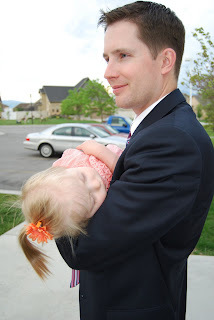 Oh let my soul ever there commune with thee, That I may know what thou wouldst have me be. Lord, wilt thou purge my soul of doubt? Oh, That with thine angels I may shout Hosannas to thy holy name, And with the saints of old my mansion claim! Lord, wilt thou fill my soul with peace? That I may soon return to live with thee. So, I have been thinking about re-decorating my room for awhile. I didn't really want to spend any money, so I thought, I will just switch bedspreads with the guest bedroom and see if that gives both rooms a new look. Well, it did, but then I was at Costco and found the cutest brown and blue towels...and yes, it lead to a whole new look! Am I crazy...a blue wall??? I was going to paint the wall chocolate brown, but with the brown drapes and the dark bedspread, I didn't want to feel like I was living in a dungeon, so hence the reason for the color blue. I promise that it looks better in person. I would love to hear your comments...good choice...bad choice? Many thanks to my sister Kristi for going shopping to a million different stores...and to my brother Tyler and Sister-in-law Nikki for your fabulous paint job! My parents came down from Montana to spend the weekend with their 3 children that still reside in the state of Utah vs. the other 4 that live in Arizona, New Hampshire, Virginia and Florida. 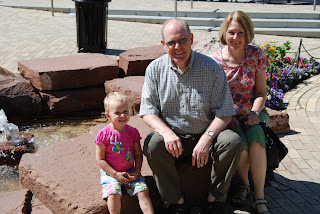 On Friday, we had fun spending the day at the Gateway. 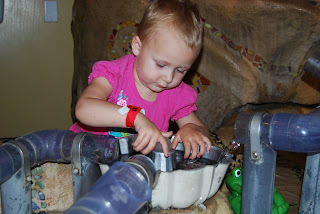 Kristi had recently purchased a yearly pass to DiscoveryKids, so we let Addy play their for a while. 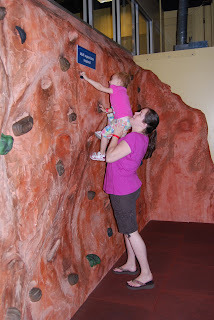 It actually is a pretty cool place for kids and there is so much for them to do. 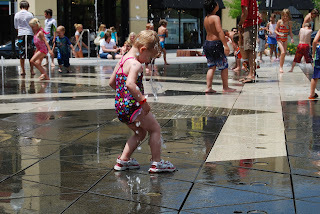 The visit to the Gateway would not have been complete if we hadn't let Addy run through the water. 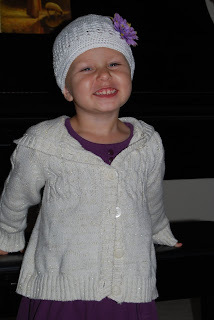 She absolutely LOVED every minute!! 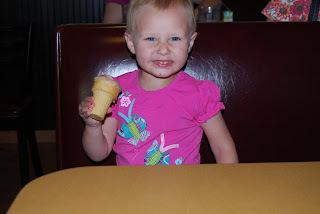 We went to lunch and ended the day with an ice-cream cone! Perfect for a hot summer day. The morning of the fourth of July. 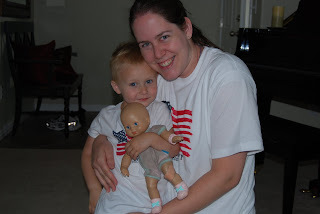 Yes, Kristi, you are a nerd for making your family wear matching shirts from Old Navy...he! he! 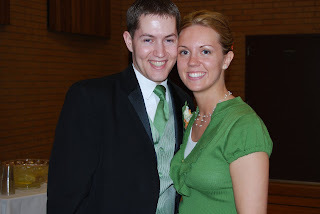 I don't have any photos, but we also had fun going to movies (i.e., My Sisters Keeper - tear jerker!, The Proposal - loved it!) and having a BBQ and playing games. 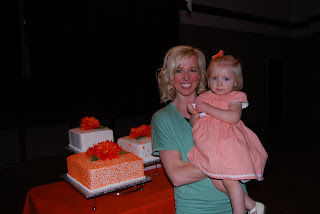 Yes, of course the momster won at 5 crowns...Jen, where were you to hold your title??? 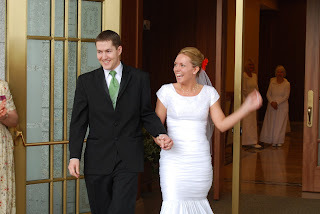 Thanks Mom and Dad for spending the weekend with us! 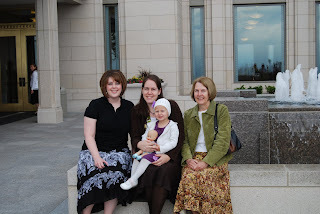 My mom, sister and niece had the opportunity to go through the Oquirrh Mountain Temple openhouse. 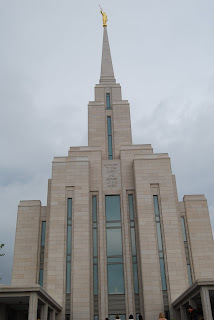 The Temple is absolutely beautiful and if you have not had a chance to go through, I would highly recommend it. 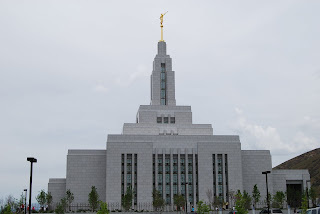 I have always had a dream of being married in the Salt Lake Temple, but on this day there was something about this Temple that made me possibly change my mind. Could it be because I was able to watch it be built, that it is basically in my backyard or that I have an awesome view from my house and I love to look out my window each night and see it glowing on the hill? Hmmm...only faith, patience and hope will answer this question. 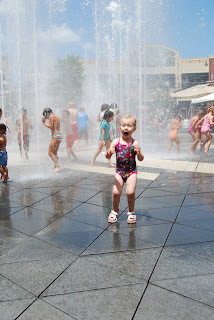 The joy of a child. 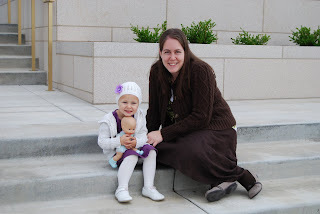 Addy, I'm not sure if you will remember this day, since you are only 2 and 1/2, but it was such a great experience to walk through the Temple with you and hear your cute comments, such as..."ooohhh sparkles", pointing to the oxen and saying, "hi, what are you doing down there?" 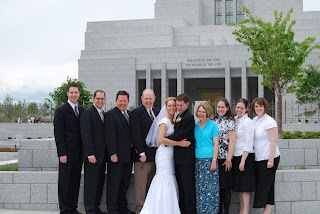 My brother Tyler was married on May 23, 2009 in the Draper, Utah Temple. The day was absolutely beautiful. Who didn't get the "black & white memo"...just teasing mom...you look great! 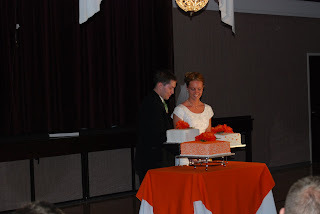 My sister's and mom (yes, I take no credit) did an amazing job on the wedding luncheon. Way to go girls! 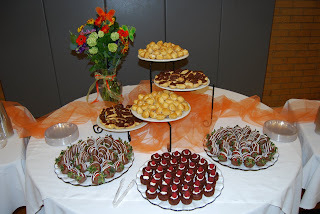 Eclairs, cream puffs, hand dipped strawberries, brownie bites...the dessert table definitely rocked! 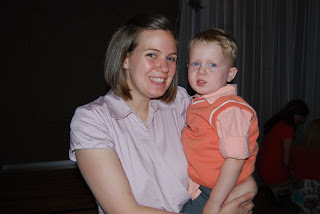 Jen and Griffyn...you both look so cute! Abby and Maiya I can't believe how fast you two are growing up. You are such beautiful girls and I love you so much! 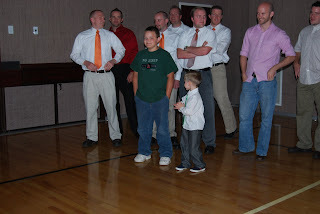 Cache joined right in with all the single guys and so desperately wanted to catch the garter...unfortunately, the kid next to him dove and caught it. 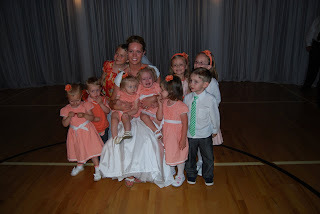 We tried all night to get a great picture of all of the grandkids...this was the best we could do...they simple didn't want to have anything to do with it...even with a bribe of gummy bears from Aunt Marcia! 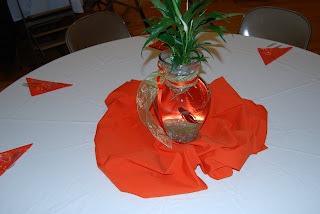 Do you want to know what the grandkids were doing during the reception? 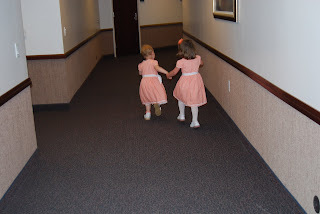 Yep, running down the halls. 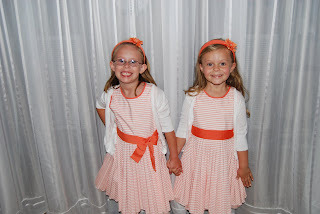 Addy and Ally...silly girls. 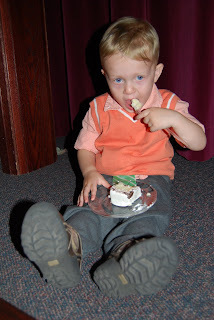 Thomas enjoying a piece of the wedding cake. This picture says it all. It was long day, but worth every minute. 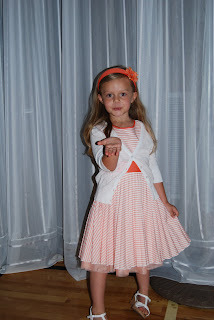 Nikki, you are such a cute girl and we are so glad to have you as part of the family.